Are you looking to take a vacation but don’t know how to go about planning one? Would you like to work with travel professionals who have the contacts and expertise? A-1 Scuba and Travel Aquatics Center is a travel agency with experience in planning perfect vacations; from dive trips to romantic destination weddings. Whether you want to relax, explore, or be active on your dive trips or vacation, A-1 Scuba and Travel Aquatics Center can help. If you know where you want to go, we can take care of the details. If you are unsure where the ideal spot is, let us know what your vacation goals are, and we can name the perfect spot for you. Have you been taking scuba diving lessons and are ready to complete your training dives in open water? We can help you find the perfect locations and work out all the details to ensure your experience is amazing. Have you been dreaming of drinking wine and eating great food across Italy? Let us plan your perfect European vacation. Would you prefer to visit different locales but stay in the same room the whole time? A cruise may be the ideal vacation for you. 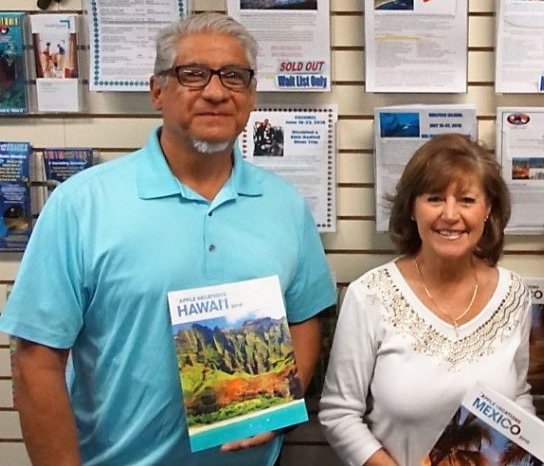 A-1 Scuba and Travel Aquatic Center’s travel agents have extensive knowledge of numerous destinations so we can outline details and tips to ensure your vacation is the best that it can possibly be. Whether you’re planning a getaway for you and your significant other, want the perfect trip for your entire extended family, or need assistance organizing your tropical wedding, we have the tools to assist you effectively. Don’t let the thought of planning your travels affect your dreams to do so. Let us do the work, so all you are left with is to relax and enjoy. Custom Travel – Your Great Escape Awaits! A-1 Scuba will create the custom travel package of your dreams. We can help you plan a tropical vacation, tours in Europe, cruises, family vacations and more. Contact us at 303-789-2450 or 800-783-SCUBA today! Travel with an A-1 group to an exotic diving location! It’s an adventure you will not want to miss! We minimize the details and maximize the fun. Led by a PADI Master Diver Trainer, who is an Emergency First Aid Instructor and DAN Diving Emergency Management Provider. Why Book Travel Through A-1? Since 1959 – we have been a family owned and operated business. You can always deal face to face with a friendly travel professional. We have three agents to serve you with a combined experience of over 50 years! While dive travel is our specialty, we can also book you to Las Vegas, Disneyland, cruises, car rentals and other adventures. We include a coupon savings book with over $250 in savings with all our reservations. Our travel agency has comfortable surroundings for you to book that dream vacation including brochures, videos and DVDs. For our traveling certified divers, we include a FREE pool workout with every booking: a$25 value. We’re the real deal — a full-service travel agency. We’re an active member of the Airline Reporting Corporation utilizing the Sabre booking system. We arrange individual as well as escorted group trips for divers and non-divers alike, to a variety of destinations around the world from the simple and economical to the romantic and exotic. Please come in and plan your dream vacation with an A-1 travel professional. Our travel experts await your call. Before you leave for your trip, consider getting DAN travel insurance. As a member of the Divers Alert Network, you are eligible for a variety of benefits—insurance being one of them. Dive equipment – as a diver, you have invested quite a bit in equipment and gear (i.e., underwater cameras, regulators, computers, BCD’s, lights, etc.) When you ensure your equipment, it is protected in the event of an accident. Trip – Unfortunately, an unexpected and unpreventable event can cause you to have to cancel your vacation. Whether it is illness, weather, or a family emergency, DAN travel insurance will keep you from losing your travel investment. Annual travel – if you are able to travel extensively throughout the year, the annual DAN travel insurance plan protects all of your trips. You are covered for emergency assistance, sporting equipment, transportation, luggage, and trip cancellation. As a DAN Member, you are eligible for dive accident, trip, and renewal insurance. No one expects to have any problems occur before or during a trip but situations may arise before departure or during your trip, over which you have no control. Travel insurance may provide extra protection for unexpected traveling problems. These problems could result from accident, illness, airline bankruptcy, lost luggage, canceled or interrupted trip. Travel insurance is available at an additional cost and is highly recommended. A-1 Scuba & Travel Aquatics Center is not an insurance company. As insurance coverage and premiums may differ from company to company and certain exclusions may occur, it is your responsibility to review the insurance coverage provided to determine the nature and extent of coverage. We also recommend the purchase of DAN (Divers Alert Network) insurance for dive emergencies. Your A-1 travel agent will gladly provide you with insurance contact information from Travel Guard, DAN and, if applicable, Apple Vacations. Please recognize that the decision to purchase insurance, and what insurance, if any, is your decision alone. Note: Some insurance carriers provide coverage for any “pre-existing medical condition” as well as coverage for the failure of a travel provider, as long as you purchase coverage for your total non-refundable trip cost within 15 days of initial trip deposit. With international travel insurance through Travel Guard, you’ll have coverage that travels wherever you do. Whether you need coverage for medical care, trip interruption or emergency travel services, Travel Guard is there for you. The policy is a comprehensive package of travel assistance services – a 24-hour “911” hotline for all types of travel emergencies.